Home » Recipes » Desserts » Crashed and Burned… leave well enough alone! Ok, maybe I didn’t totally “crash and burn” on my attempt for a healthier cookie, but the kids didn’t like it and I must admit, it wasn’t my favorite either. I made chocolate chip cookies using unbleached whole wheat flour and raw sugar instead of refined white sugar. I did use regular unsalted butter, brown sugar, etc… but I tried to “health it up” using the whole wheat flour and raw sugar. The outcome was a grainer cookie that lacks flavor with an odd aftertaste. You could also taste the crunchy raw sugar. 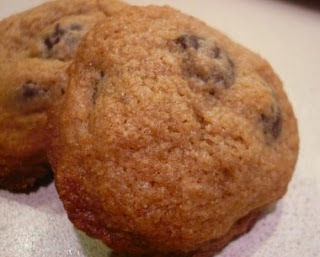 Which works perfectly for snicker-doodles topping by the way, but not so good in a classic chocolate chip cookie. Moral of the story: leave well enough alone, go with the classic recipe of a chocolate chip cookie and just pace yourself. The key is moderation and portion control. 2. add in eggs, one at a time and mix well. 4. scrape bowl and add flour, salt and baking soda. 6. mix in chips until combined. 8. Refrigerate dough until firm and oven is pre-heated. This is the trick to baking a chewy raised cookie instead of a flat cookie. 9. Bake on a Silpat Baking Sheet for 7 to 9 minutes or until golden brown edges. Just read your take on the Chocolate Chip cookie flour flop. I too have tried to come up with healthier ways to bake using whole wheat flour. Have you tried experimenting with a mix of flours since then? I finally found that if you do no more than 1/2 the amount using the whole wheat and either all-purpose, bread, or white rice flour, it does the trick without loosing the flavor. Sometimes it is a matter of trial and error before you find the right combination and it varies from recipe to recipe. When it comes to the Chocolate Chip cookie though – you have to be really creative with the classic to keep it the classic!